We are a big fan of cookbooks here at Table, we’ve even been known to read them like novels while on the tube on our way to work. This summer we were recommended a book by chef, Claire Thomson called The Art of the Larder. A book encouraging you to fish around those shelves filled to the brim with tins of beans, bags of grains and sauces galore. It’s a handy book to gather inspiration from with recipes that can be amended depending on what you have available. We asked the lovely Claire to share an excerpt from her book with us from the ‘Pulses’ chapter. 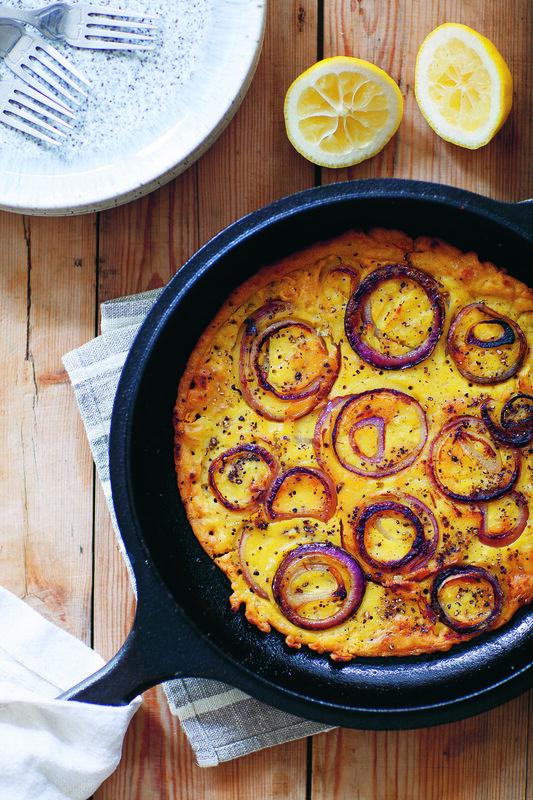 She also included her ‘Ligurian Farinata with Red Onion and Lots of Black Pepper’ recipe. In India, Pakistan, the Middle East, North Africa, South America and Europe, pulses have long been considered a key ingredient to store and use throughout the year. In Europe especially, the fava bean has been one of the most crucial, in use since the Bronze Age. Interesting, then, that nowadays broad beans, picked immature and eaten seasonally, have usurped the smaller dried fava as the bean of choice. Stigmatized as a food of the poor, dried pulses fell out of favour when meat and dairy gained in popularity as the more exclusive source of protein for the wealthy. Unfortunately for pulses, their penurious reputation has proved an onerous one to shake off. Efficient to grow and brilliant to eat, we need to reclaim our pulse-eating mojo and make them a mainstay once more. Michael Pollan’s rallying call of ‘Eat food. Not too much. And mostly plants.’ is dazzling in its sentiment and succinctness. It is the catchphrase of our generation and, fingers crossed, its efficacy has been potent. Pulse production is on the increase. Certainly one of the world’s most proficient plants, there are now over 173 countries growing and exporting some 60 million tonnes of pulses a year (see www.pulses.org) and 2016 was the United Nations international year of the pulse, intended to raise the profile of pulses in the global diet. When cooking with pulses, my approach is twofold. For quick, speedy cooking, tinned beans and chickpeas and dried lentils and split peas fall into the category of quick-cook pulses. Ready cooked and in the tin, beans and chickpeas, rinsed of their briny gloop, enjoy frequent use. Softer, more slippery in texture, tinned beans are terrific used whole in wet, soupy dishes or mashed down with more flavour: onions, garlic, herbs and spices. The rescue ingredient for many a lunch or supper, tinned beans and chickpeas, pudgy and fulsome and taking minutes to make good, are full of sustenance and flavour. Unashamedly in tins and always on my shelves are butter beans, cannellini beans, haricot beans, kidney beans and chickpeas. split lentil and share a similar affinity with split yellow peas. Both varieties cook quickly, collapsing into any ingredients you prepare them with. In haleem, the red lentils and the split peas slump modestly among the brown rice and cracked wheat to give a mixed grain dhal with a sublime texture. Super-cheap and stocked almost everywhere, these are the indispensable handfuls to chuck into soups and purées and to cook into dhal dishes. Like porridge, not too soupy, not too starchy, these lentils respond well to assertive flavouring: turmeric to brighten, ginger to warm and spices to invigorate. In winter time my use of lentils will rely on a tiny dice of onions, carrots and celery, some bay leaves too, cooked down until sticky and aromatic – patience – the lentils are added and simmered in water until soft but still holding their shape. This is a dish I could eat for ever. Make enough; serve with sausages or a fried egg for supper and serve again the next day, the day after, as sauce to some pasta. In summertime, green lentils respond brilliantly to being dressed while still warm, a salad of sorts, drunk on olive oil and good vinegar or citrus juice and given a showy burst of chopped herbs and olives. Whatever the season and however I am cooking with lentils, I don’t think I could ever be friends with someone who said they didn’t like to eat them. Like tiny pebbles, dainty little things packed full of flavour, cooked lentils also age gracefully, tasting better for a day or two wallowing in a little of their own cooking liquid. Slow-cook pulses are dried beans and chickpeas, and both require soaking in water before use. Plump and glistening, only after soaking can any real cooking begin. Cooked fresh, these pulses have a superior texture to their tinned versions and are a brilliant substitute for grains, pasta or noodles and potatoes in everyday cooking. When you do cook with dried pulses, I think it’s absolutely worth cooking more than just the one meal’s worth and using them incrementally over a few days, throwing them into soups, stews, warm salads, on to toast, into frittatas or blitzing them into a purée. You know the drill: tahini, garlic, lemon juice, water and salt drowned in olive oil for hummus. Better still, and because I’m a tiny bit bored of the beige stuff, white beans (cannellini preferably) freshly cooked and blended with some of the bean cooking liquor, some garlic and salt, barely warm and bathed in a fruity olive oil. On toast, with bread, this is a great dish, so very simple. And while the UK may have cut their culinary ties (give it time . . .) with dried fava as the common use for bean crops, you can still buy the dried beans from many Mediterranean grocery shops and online stockists. Prepare these fudgy beans like they do in Egypt, cooked down with onions, cumin and plenty of fresh herbs as ful medames. Commonly eaten at breakfast (and also to break the fast), it is stuffed in pita bread with chopped salad, hard-boiled egg and lemon wedges. Alternatively, buy split dried fava beans to soak and blitz raw for the falafel recipe (see page 66). With a crisp shell and a vivid green interior, these falafel are knockout. Any stodgy orbs masquerading as falafel will be put to shame. Socca, as it is known in the south of France, or farinata, as it’s called in Italy, specifically in Liguria, is a popular street food. It is baked flat like a pancake and cut into wedges. In a bowl, mix the water with the gram flour, olive oil and salt. Cover and let stand for about an hour at room temperature. Prepare the batter as and divide the mix in two, to make two thinner pancakes. When ready to cook, heat a well-seasoned 30cm cast iron frying pan to very hot. Add about 2–3 tablespoons of olive oil, and pour half the batter into the pan. Quickly distribute half the onion rings into the batter and continue to fry over a moderate to high heat for 2–3 minutes. Add half the black pepper to the batter as it cooks. Check to see that the underside is nicely crisped, then quickly flip the farinata over and cook on the other side for a further 2–3 minutes, until the sides are crisp and the onion beneath has softened and coloured considerably. Remove from the heat and serve immediately, with plenty of lemon squeezed over the farinata and salt to taste. Repeat with the remaining batter, onions and pepper to make the second one while you eat the first piping hot.